Papua New Guinea's Prime Minister Peter O’Neill says they are now planning to improve the Common Roll in preparation for the 2022 elections. He said they would be sending a team to India to see the election electronic system used there. 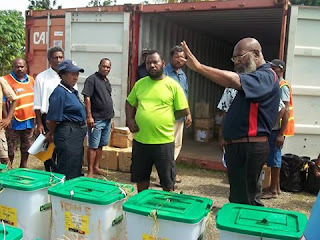 "The team will be headed by National Planning Minister Richard Maru and Communications Minister Sam Basil and will include officers from the PNG Electoral Commission and Office of the Civil Registry National Identification. They will go and see the software and structure set up by the Indian government that have delivered their election in a timely basis,” the prime minster said. “About 700 million people had voted in India and the elections results came out in a matter of days. O’Neill provided the Government’s brief plan after Opposition Leader Patrick Pruaitch and Nuku MP Joseph Sungi expressed concern that this year’s election was mismanaged. “Yes, we had incidences of violence and lives and properties have been lost, large number of communities disrupted in relation to election violence,” O’Neill said. “And now the Government has set up a team to review recommendations from the Commonwealth Secretariat election observers group. “That report is with the Government. The issues that were raised are similar to the 2002, 2007 and 2012 elections like election violence, Common Roll updating, double-voting and so on. “The same issues have been brought up in 2017, said O'Neill.